This kid, he's got moves. He's recently started kicking his feet, moving his arms, and squealing with glee when you talk to him (especially when he's in his bouncy party chair). Could it be that the Baggerman gene that inhibits one's sense of rhythm has skipped a generation? Or is he fated to plod out an odd interpretation of the Electric Slide like the rest of us? Looks like you might want to loosen those waistbands there, pal. Doesn't he just look like that guy who sits across from you on the train who dozes off and misses his stop? Although Daddy has returned to work this week (booooo! 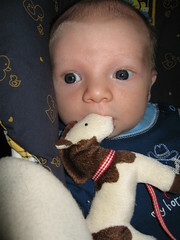 ), I'm pleased to report that Finn and I are acheiving new milestones every day. Monday, we went shopping and to the doctor's. Tuesday, we went for a stroll with our moms' group and went to Safeway without incident (I was particularly apprehensive about the potential for a poopxlosion in the produce section). And today, we are running some errands after getting a slow start. (Watching Gilmore Girls and nursing.) Tonight I will attempt cooking a home-cooked meal (enchiladas!) for the first time in weeks. No freezer food or takeout tonight! While I hate to even mention this for fear of jinxing anything, the little guy has been sleeping for three and four hour stretches. At night! Monday night I got an unprecidented seven straight hours of sleep (Shawn took the midnight feeding). Last night, I got five straight hours. This so beats the every-hour to every-two-hour schedule. 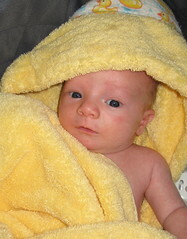 bathtime just got a whole lot cuter..
... thanks to this duckie towel from Uncle Kevin and Aunt Gretchen. yo finn, what are you doing with britney? I'd like to assure all concerned parties that any resemblance between Finn and Sean Preston Spears Federline is purely coincidental. - when you go "bbbbbbb" or "lalllalllalala"
- the hours between 5-7p.m. 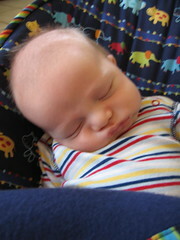 Also worth noting that last night, for the first time in three weeks, the boy slept for longer than 2 hours at a time! He took one four hour nap, followed by a three hour nap, followed by a two-hour nap. Ohhh, this was such a welcome development. Considering Finn's mama has been known to hold entire conversations in her sleep (seriously--ask her college roommates), and daddy can sleep through nearly anything including an earthquake (again, seriously), we're holding out for those sleep genes to take root. 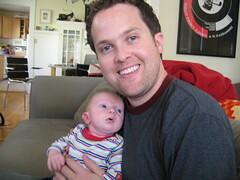 Unfortunately, this is the last week Shawn will be home with Finn and me. We're trying to live up all the daddy perks while we can, like help getting Finn into his car seat and trading off diaper changes during the day. Finn's full-on Web site is live. Tons of photos, if you haven't seen enough already. Click here. 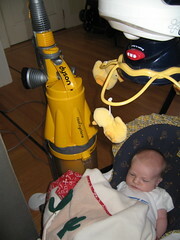 When all else fails, our robot nanny, Ms. Dyson, comes to the rescue. As you can see here, her soothing white noise lullaby can tame the most savage of baby wails. - the difference between the "diaper champ" and "diaper genie"
- the "no-cry sleep solution"
His first nickname was actually "Houdini" because of his uncanny ability to escape from even the tightest swaddle. 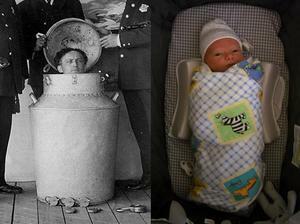 Here he is shown alongside his namesake, who's also about to be "contained"--but not for long! ... It's early yet, but we will be adding to this list throughout the day. * "Butteryham" originated because when he needs a bath smells something like butter meets ham. Or how we imagine buttered ham might smell. 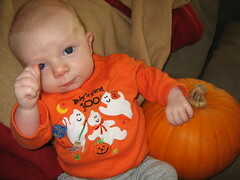 When we went to the pediatrician for Finn's one-month checkup, the doctor warned that starting about now is when some babies "find their voice" and start being a bit more fussy and demanding. At the time, I thought, "Well, Finn is not 'some babies.'" This was reinforced by the fact that he really didn't even really fuss too much after getting a shot and being poked and prodded in a cold exam room. All while a less-civilized newborn in the room next door wailed with wild abandon. Well, homeboy has found his voice and then some. All of the sudden, it's like he's making sure we know there's a new sheriff in town, even if he weighs just under 10lbs. He was up last night from about 1am to 7am, which is great if you are a member of Motley Crue, but not so great if you are a new parent and dying for more than two hours of sleep at a time. I was getting pretty cocky for a while. 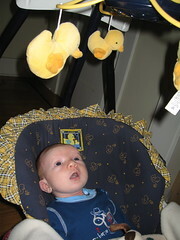 When Meg was over the other night, she was marvelling at how little Finn just hung out in his swing, peacefully awake for her entire visit. And when the Chronicle Girls came over last week, the little guy allowed himself to be passed from lap to lap, looking longingly into each girls' eyes. And like a good little boy, when it was time for us to watch America's Next Top Model, he dutifully fell asleep in someone's arms. Finn was doing some powerful PR in support of adorable newborns everywhere. While still undeniably adorable, the Finnster was up and partying like a Hilton sister last night from 2am to 9am. 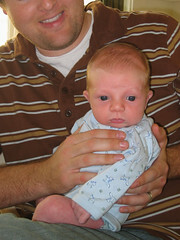 When he wasn't nursing, he wanted to be rocked. 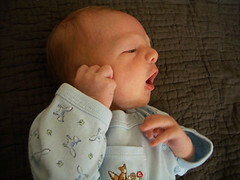 When he tired of rocking, it was put-the-binky-back-in-his-mouth game. Then, like a belligerent drunk, he'd be all, "Where the heck is my next drink, people?" like he hadn't just eaten. When Finn exhausted my milk reserves, Daddy came in with the pumped stuff. And when that ran dry, Daddy brought in the formula. 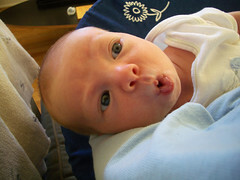 Hours later, when the child had practically eaten his weight in milk, he was fussy as he dealt with his milk hangover. If he thinks he's going to sleep it off all day and then start up again tonight, he's got another thing coming. 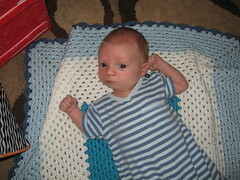 PS: Adorable blanket in the background was crocheted by one Nancy Barretto! I talked to dear Margot for a long, long time the other day and she said that one of the things that is most amazing about being a mother is that these little ones grow literally in your arms every day. We're back, Finn Fans. I've been sick for the past couple days and have finally do what everyone told me to do before Finn was born--sleep when the baby sleeps. Day and night were blurred completely there for a while, but I now actually feel like I've caught up on some much-needed sleep. 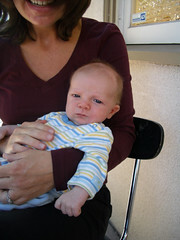 More photos soon, but we took this one today of Finn and I sitting on the back porch. He's clearly contemplating something of great significance like quantum physics or when the next feeding will be. 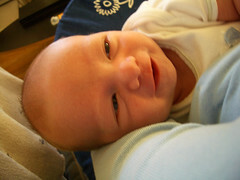 So, all the books agree that it's a little early for Finn to be smiling (he's almost 4 weeks). But ever so often, he comes up with these adorable gummy grins that just melt your heart. 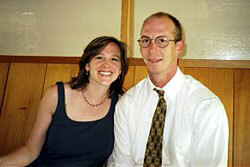 And yes, to be fair, these grins are often followed by some serious adult-caliber pooping noises. (I'm telling you, the boy is quite advanced for his age.) But, poop and all, I'll still take the gummy grins when I can get 'em. 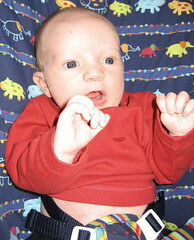 Finn reacts with surprise and horror to the news that Tom Cruise and Katie (sorry, now it's "Kate") Holmes are expecting a Scientologist baby (and future peer). By the way, Access Hollywood is currently the nursing program of choice. 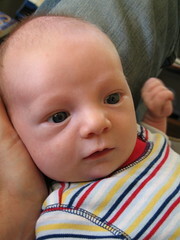 Auntie Julie took this adorable picture of Finn perched on his daddy's lap. 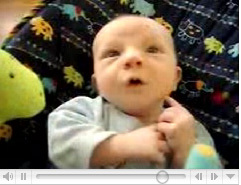 Doesn't he look wise beyond his age--he's only 3-1/2 weeks! 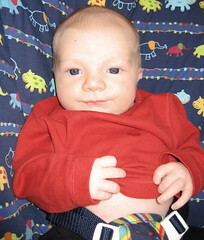 I'm happy to report that he's finally bulking up--he just got back from being weighed and put on nine ounces in a week! I'm glad those hours of nursing are finally paying off. Santos has decided that if he can't beat 'em, he'll join 'em. 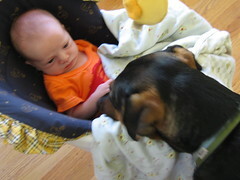 To demonstrate that he's on board with the new baby, he kisses Finn's toes and sits with me while I nurse. Santos' ears do go flat and he looks as if he would roll his eyes if he could when Finn starts crying, but you can only expect a spoiled dog to have so much patience with a newborn baby. For his part, Finn has taken a passing interest in his big, furry brother, but clearly, there is room for this relationship to grow. I predict this will happen right around the time Finn can pass food to Santos from the highchair. Right on schedule, Finn seems to be undergoing a growth spurt. To say this is to say that the kid is attached to my hooters the better part of the day. When I finally think he's sated, he does one of those cartoon baby wails (where you can practically see his tonsils quiver) and goes for more. It's a good thing he's so darn cute, because hooter duty at 4a.m. is really starting to get old. I feel like I'm wearing chain mail, I'm so tired.